next couple of weeks offers a great double-bill: a showing of a planetary alignment and the year's best meteor shower. If you have been looking low in the western sky shortly after sunset the last few weeks, you might have noticed an orange coloured, starlike Mars slowly passing beneath a white, starlike Saturn. But now the brightest planet in the sky, Venus, will be joining in on the fun and glide below Saturn the next week or so. The planetary trio will then slowly form a spectacular triangle of stars. Tonight and Friday, Mars, Saturn and Venus will fit inside the view of a pair of binoculars. The main act, however, will be on Aug. 10, when the three will form a near isosceles triangle, with two of the sides nearly equal, having brilliant Venus anchoring the bottom, orange Mars to the upper left and golden Saturn to the upper right. Adding to the beauty will be a thin crescent moon joining just below the trio on the evening of Thursday, Aug. 12. By the next evening, the moon will have moved higher in the sky and jumped to the left of the planets. The final act of the planet show will be on Aug. 16, when Venus passes just below Mars. After that the planets begin to sink quickly toward the western horizon. By the end of the month, the glare of the sun will hide all of them. 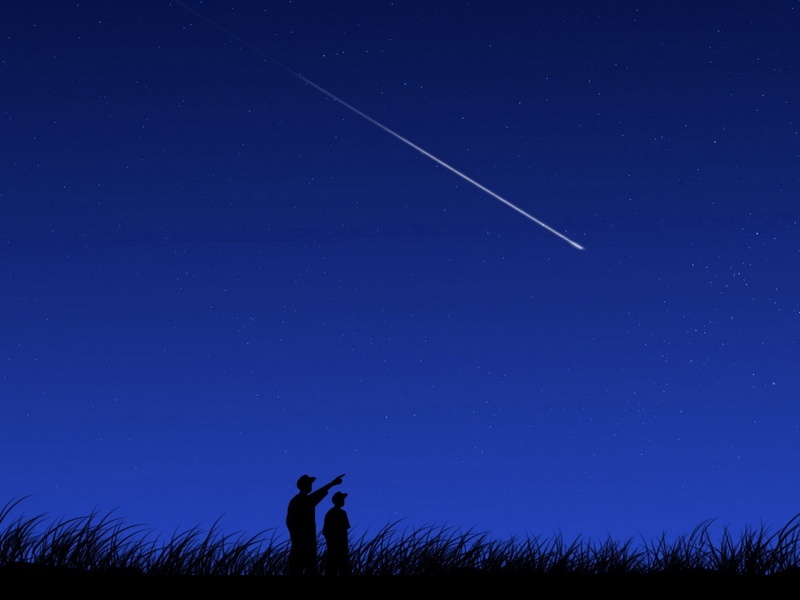 The second big astronomical crowd-pleaser this month will be the famous Perseid meteor shower. Peaking on the night of Aug. 12 and into the early morning hours, conditions promise to be particularly favourable this year because there will be no moon interfering with the fireworks display. You can expect up to 30 to 60 meteors per hour visible from the West Island and up to 120 from a dark sky. You can expect about half that many the night before (Aug. 11) and after that date (Aug. 13). The best way to see the shower is to lie on the ground or a reclining lawn chair facing the northeast sky. Most of these meteors are the size of a grain of sand and are travelling at about 150,000 kilo-metres per hour, burning up at about 100 km above your head. The Perseids get their name from the constellation Perseus -where the shooting stars seem to radiate. The meteor shower originates from a cloud of particles in space that was shed by a comet that orbits the sun. Every year at the same time, Earth slams into this cloud of debris, creating a cosmic shower in the heavens. If the skies are clear Aug. 12, join the Royal Astronomical Society of Canada for a free Perseids star party at the Morgan Arboretum in Ste. Anne de Bellevue starting at 8 p.m. with a lecture. In case of poor visibility, the event will be moved to Aug. 13.